Joel Greenblatt’s Little Book delivers a crash course in value investing. 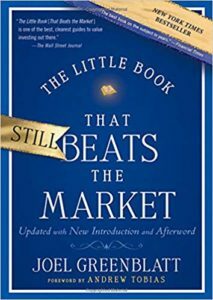 He covers how to view the market, why most people fail to beat the market, metrics for quality and low priced stocks, and how his Magic Formula works. The stock market is an opportunity factory. It’s a place where you can buy a business for a lot less than its worth. Or you can sell a business for more than it’s worth. Or you can overpay and undersell. Buying shares of a business entitle you to an equal share of the business’s future earnings. What do you think the business will earn next year — a best estimate — the same, more, or less? How confident are you in that earnings estimate? How will earnings grow after that? It boils down to attempting to measure uncertainty. More consistent businesses — smaller range in earnings from one year to the next — are easier to estimate. More erratic businesses — wider range in earnings from one year to the next — are much harder (to impossible) to estimate. The range offers a high and low estimate for potential returns to compare against a risk-free return (the conservative – low estimate – should be higher than the risk-free rate). Alternatively, consistency tends to offer less risk than inconsistent earnings. The range of stock prices, for individual companies, vary widely over a one-year period. The range of a stock’s 52-week high and low shows just how widely prices move in a short period of time. Over a 2 or 3 year period, the range would be even wider. Yet, we’re supposed to believe the value of these same companies move around that much too. It’s possible something drastically changed — selling much more product or much higher earnings — in the business. But it’s unlikely to be happening to every company. The price paid is driven by attitudes and estimates. Price and value are not the same thing! You want to buy shares at a margin of safety — a big enough discount to value — to protect from losing money but also to have enough room to still make money in case your wrong. Return on Capital — A higher return on capital is better than a low one; a company that reinvests its capital at a high rate of return is better than a company that reinvests at a low rate. Combining the two — a high earnings yield and high return on capital — you get high-quality businesses at bargain prices. Systematically investing in the two can make a lot of money. The gist of Greenblatt’s Magic Formula. Graham showed that a simple system, stuck too, can achieve good returns over time. Essentially, Graham set specific rules on what type of stocks to buy, how many to buy, and when to sell. He did it in a way that, on average, bought bargains that produced “satisfactory” returns. Greenblatt then adapted those rules to meet his high quality, bargain priced requirements and tested it. The results were good – from 1988 to 2004 his strategy earned about 30.8% per year, beating the market return of 12.3% per year. The formula ranks the largest 3,500 companies by return on capital – highest to lowest – the best RoC gets #1 and so on. The formula ranks the largest 3,500 companies by earnings yield – highest to lowest – the best EY gets #1 and so on. The formula combines the two rankings – return on capital and earnings yield ranks – by adding them together. The companies are ranked by the combined total – lowest total is best. The Magic Formula ranks stocks by quality and cheapness, making sure that there will always be highly ranked stocks to invest in. It’s a relative ranking formula, meaning stocks are ranked in relation to every stock. Unlike Graham’s original formula where only stocks meeting the requirements were listed, the Magic Formula ranks every stock in relation to the entire group. As a model, there are always limits. In this case, while there will always be a ranked list of stocks, it’s possible that all the stocks ranked might, for example, be expensive (with the model showing the cheapest expensive stocks). The Magic Formula doesn’t work all the time! It has periods where it underperforms the market. On average, every 5 out of 12 months it underperforms. You just don’t know which 5 months it will be. Over 5-yr periods, one of every 4 years it underperformed. The hard part is sticking with it and not second-guessing the formula during the underperforming periods. Most people quit after a losing period and chase returns somewhere else. In order to stick with a strategy, you must understand how and why it works. The basic principles behind it should be timeless. More important you must accept that it works. Above-average companies = Quality companies that can invest profits at a high rate of return (high ROIC). Companies that earn a high ROIC can reinvest capital at a high rate, which can grow profits at a high rate. Companies that continue to earn a high ROIC, are candidates for some type of competitive advantage (temporary or permanent) that keeps competition from eating away at its returns. Companies without an “advantage” most likely earn a lower ROIC. Success happens over the long term. Because Mr. Market is manic/depressive in the short term, you can buy and sell stocks at crazy prices. Over the long term, Mr. Market eventually get its right. It’s the short term that gets people in trouble. Stocks sell at bargain prices because the view of these companies looks dim. Outlook and expectations are low, oftentimes ugly. They look less like bargains and more like trash. In a perfect world, you’d estimate next year’s earnings and several years after to find companies with a high enough ROIC and EY. (And finding a management that can allocate capital at a high return). This is difficult. If you can’t analyze companies it’s best to take a broader approach. If you’re going to pick stocks, limit it to a small number of quality bargains. A concentrated group of 5 to 8 stocks in different industries can make up about 80% of the total portfolio. However, the Magic Formula, with its basket of stocks, shows that, on average, using last year’s earnings is a good indicator (estimate) of future earnings too. With the stock market, you’re very much on your own. There’s no “tooth fairy” that magically hands out money. You need to do work to beat the market or accept average returns with index funds. Taking advantage of a solid long-term strategy — one can you stick with — combined with tax-advantaged accounts is the best way to compound your money over time! The afterward covers the five year period after the 1st edition was published. The basic principles behind the Magic formula haven’t changed. Buying stocks with a margin of safety is still the most important investing concept. Buffett and Munger’s idea of buying good businesses with a margin of safety still works too. Owning businesses with a high rate of return – serial compounders – can grow value over time and increase its margin of safety. The Magic Formula is a long-only strategy. It was suggested and tested as a long/short strategy — going long the highest quality/cheapest stocks and shorting the lowest quality/expensive stocks. The long/short strategy blew up around 2000 with a 100% loss. The real benefits go to those investors who keep it as a true long-only strategy. Greenblatt believes the principles behind the Magic Formula should work in other developed/emerging markets. Greenblatt admits that the Magic Formula — while it’s supposed to be simple — is not simple to manage. Just keeping track of buying and selling is difficult. Biases play a big role in that too. EBIT was used because companies don’t have the same amount of debt or tax rate. It allowed for equal comparison without debt and tax rate distortions. Greenblatt assumed that EBITDA – Maintenance Capex/Expenditures = EBIT. He assumed that maintenance capex was roughly similar to depreciation and amortization charges. Net Working Capital was used because a company has to fund receivables and inventory. Excess cash was excluded. Short term debt was excluded from current liabilities. Net Fixed Assets was used because fixed assets — plant, equipment, real estate — are needed to run the business. The depreciated cost was added back into this. EBIT/EV is used to find out how much the business earns in relation to the purchase price of the business. EV takes into account both the price paid and the debt used to generate operating earnings. EBIT is used for the same reason, to compare companies equally pre-tax and interest. Many studies confirm that value strategies outperform the market over time. There are several different simple measures for value: low P/B, P/E, P/FCF, P/S, and P/dividend. Most of these value measures perform best with smaller cap stocks. The Magic Formula does as well. The Magic Formula seems to outperform with large caps, where other value measures have failed.